Much of my past year can be divided into two distinct eras: BC (Before crash (or cows)) and AD (After death). 2009 was blissfully "BC" until the beginning of May, when Bessie, my old computer, suddenly and most inconveniently died. If she had had the courtesy to check the status of my calendar and my bank account (not to mention my sanity) she would have realized what a really REALLY REALLY REALLY CAPS LOCK LEANED OVER AND BOLD bad time it was to leave me in the lurch, forcing me to change over to both a new computer AND a new operating system. All that was left of the old ways was a nearly defunct internal hard drive that was sitting -- quite externally and with cords akimbo -- on my desk. This was not the way it was supposed to end. Granted, computers, much like cars and most relationships, never stop working at a particularly GOOD or even convenient time. If they did, country music might never have been invented. But this crash was particularly bad because I was in the middle of a super secret project that had a deadline. Chatting with my siblings, we decided we had better get on the ball and do something for GramTuna's birthday in May. Of course, we do something every year, but that something generally consists of dinner and cake and presents and happy birthday and seeya in 365. This year needed to be a great deal more, because it was one of those years. Of course, it would be bad form to tell you exactly which one of those years it was, so I'll just say she was about to turn six trombones short of a musical. Being one of four very busy children with obligations that included scurrying chicks and ducks, calendars chock-full of concerts and lessons and soccer and basketball games and lives that were continually interrupted enhanced by home improvement projects, we decided to divide and conquer the various components of the SURPRISE PARTY so we could get everything done. 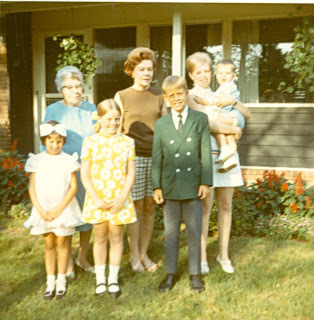 My job -- the one I offered to do -- was to go through the family pictures...the boxes and boxes and boxes and boxes of slides and old photo albums and get them all scanned and loaded onto a digital picture frame. I volunteered to do this first of all, because it was something we had talked about doing for quite awhile. I also had the easiest access to the stash, because I live in such close proximity to the SURPRISEE. So I took every possible opportunity to break into her house, grab some slide trays or photo albums, cover my tracks, and toss the loot under my bed. I would connect the scanner at night and scan scan scan scan scan scan scan scan scan scan scan scan scan scan scan scan scan scan scan scan scan as long as I possibly could. When I finished a batch, I would replace the completed trays of slides and grab more. Twenty one boxes of slides. Times 100. And those were just the slides. 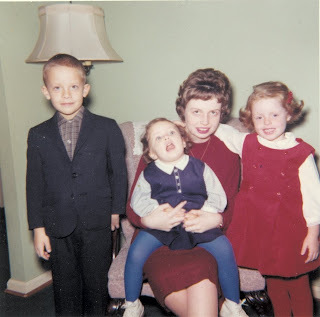 I lost track of the picture albums, some with extra clingy plastic, and others with those infernal black corners holding the photos that you would have to remove as if it were the game of Operation! 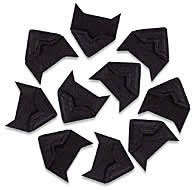 but take it from me, they are of the devil. 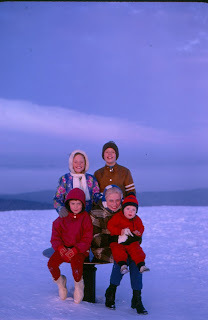 With four kids and several decades worth of adventures, there were A LOT of pictures. Sometimes at night I'd send select copies to my sister and we'd crack up about this that and the other thing. My sister calls this my "short bus" picture. This particular Easter propeller head-wear was in. So, you can see where this is going, right? I'm a couple thousand pictures into this project and then Bessie pulls a code moo and DIES....taking weeks of work with her to the big cow pie bog in the sky. Seeing my life flash before me and having several litters of kittens over this one, I take her to the computer doctor at work and tell them I'll do whatever they want, no questions asked, if they can just get the damn pictures off the old hard drive because you know...there is this SURPRISE BIRTHDAY PARTY coming up and the ENTIRE SURPRISE PART is on dead disk. So, a new computer was purchased ASAP. There was no dickering, and no dealing. There was no research. There was just frantic me running into Staples yelling COMPUTERS! Once purchased, I had to deal with downloading programs, finding my way around Vista (no easy task even when you have your wits about you) and whispering sweet nothings to the flat-lining old hard drive in an attempt to coax the pictures onto the new system. I don't know how, but thankfully we managed to get most of the pictures off. I've never begged, pleaded and bargained with The Lord God Almighty and my IT guy so much in my life, and I believe I still owe both of them something...I just can't remember if it is chocolate chip cookies or my first born. Fast-forwarding to SURPRISE PARTY day, and everything went off surprisingly well. We concocted a story that worked. Nobody was the wiser. The surprise party was an honest to goodness SURPRISE, and in a good way. Friends and family and other assorted distinguished guests came to help celebrate the day, the weather stopped sucking long enough to be nothing short of fabulous. 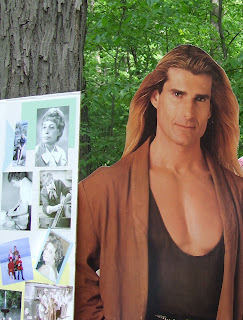 It ain't a party until Fabio shows up. The digital picture frame was great fun, and even though I never completely finished the project, with over 5000 pictures loaded on it, it was enough to keep us all entertained. As for Bessie, she and I made peace, and I still have the wreck of the Bessie Fitzgerald sitting on a shelf. Although my new computer is shiny and wonderful and reliable, I'm happy we were able to transfer the pictures and the documents and family memories off the old computer. Young heart, old soul. Just the way it should be. Happy Extremely Belated Birthday GramTuna. I was so sad to hear the whole story behind Bessy! I'm glad you were able to get most of the photos out!